Fall is quickly approaching so let’s celebrate with a batch of these delicious Baked Pumpkin Donuts! SO I decided it was time to remake them! Holy crap, these are delicious! Like, melt-in-your mouth pumpkin flavor with the sweet addition of a cinnamon and sugar coating. It took all of the willpower I had not to eat all 18 of these things as they came out of the oven. I had four woofed down in the first few minutes and decided my waist would appreciate if I slowed down. PLUS I was probably going to need some for pictures. 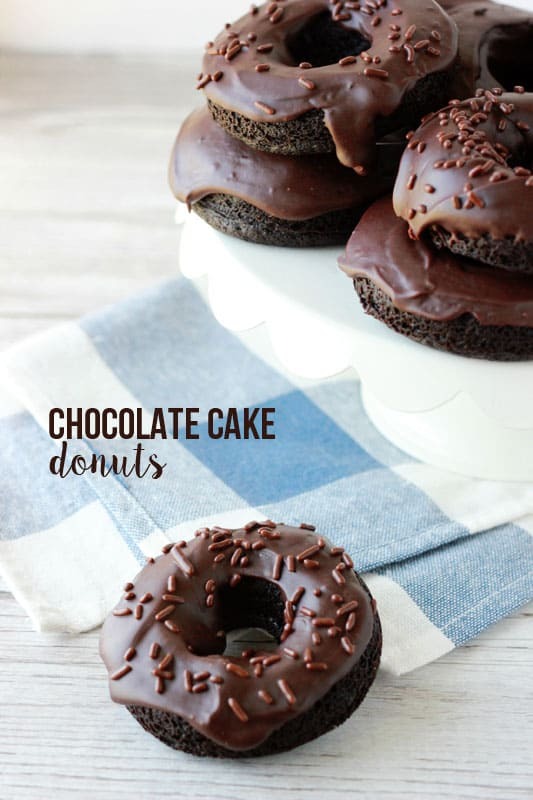 Baked donuts are always a little more cake-like. Don’t expect the raised fried dough you’re used to, but also don’t expect to hear any complaints from anyone you serve these too. Preheat your oven to 350 degrees. 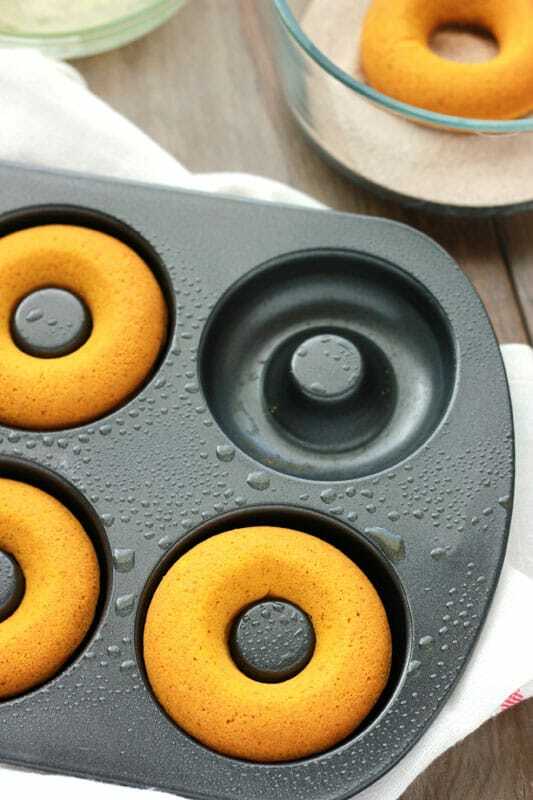 Lightly mist your donut pan with non stick spray. Whisk together the flour, baking powder, baking soda, salt, and pumpkin pie spice in a small bowl. Set aside. Combine 1/2 cup sugar with the butter in the bowl of an electric mixer. Stir with the paddle attachment on low speed until fluffy. Scrape the sides of the pan and add the egg, pumpkin, vanilla, and milk. Spoon or pipe into your prepared pans filling each space 1/2 full. Bake 12-15 minutes or until a toothpick comes out clean. While the donuts are baking whisk together the remaining 1/2 cup sugar with the cinnamon. 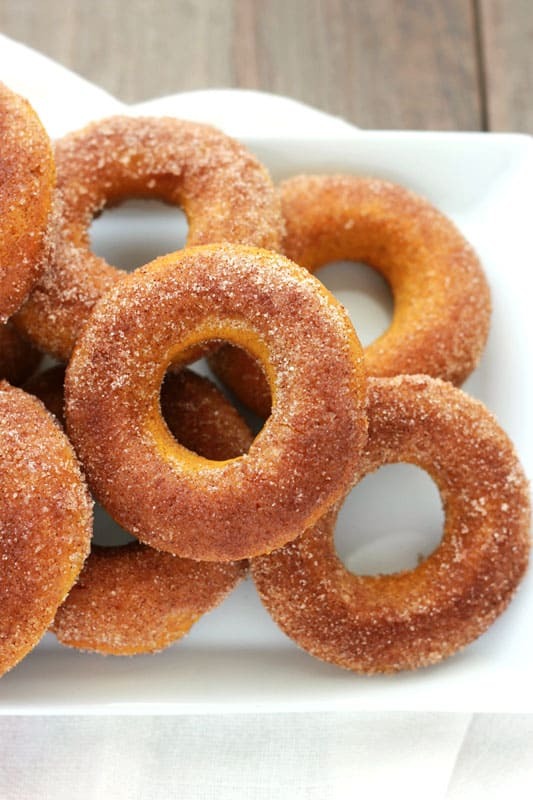 Brush each baked donut with melted butter and roll in the cinnamon sugar mixture. I don’t even know where to start! WIth the holidays coming up, it would have to be cookies!!! I think I would have to make a batch of chocolate chip cookies. There’s nothing better than eating a warm cookie that is fresh from the oven. My husband’s chocolate chip cookies! I would make my mom’s chocolate chip cookies! cookies cookies and more cookies. Love that color what a great giveaway!!! I would have to make some yummy cookies!! I would make some yummy cookies!!! Mmmm fresh pumpkin bread. Or maybe these pumpkin donuts! With a new Kitchen-Aid I would whip up some yummy Pumpkin Bread :). Mmmm fresh pumpkin bread. Or maybe these pumpkin donuts!!! Wow- that is a hard choice. There are so many things to make! I think the first thing I would make with the kitchen aid mixer would be my husbands favorite cookie- chocolate rounds. He is in the military and has been gone since April. We are finally being reunited in November and he says that is one thing he wants me to make first. I would make so many things with my stand mixer, but the first would have to be a cake. Hand-mixing those babies is getting tiresome! I will probably make my husband’s favorite cookie- chocolate rounds. He has been away with the military since April and has been missing those cookies. We are finally going to be together again and I want to do something nice for him. I would make Chocolate Chip Cookies! My husbands favorite! I would totally make some pumpkin chocolate chip cookies!! I would make Christmas cookies!! Dozens and dozens and dozens of them. And then hopefully give some away so I don’t gain 30 pounds. We love Salted Caramel Choc chip cookies at our house!! My wife could so use this mixer in the kitchen. Its even the color she wants!! 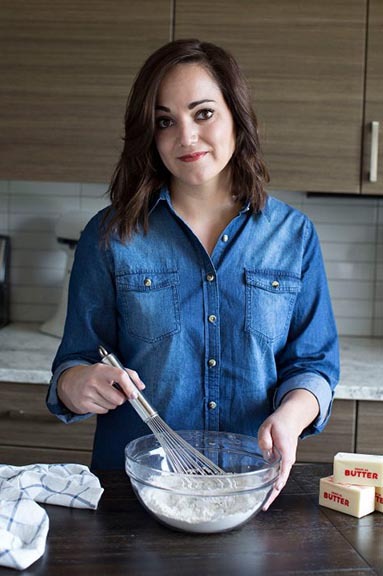 I’m with Leanne, I would make something GF, I would probably try those donut muffins with a different kind of flour and see if I can get them to work. cinnamon rolls 🙂 maybe with pumpkin icing? I’d make cookie dough to freeze and giveaway as Christmas gifts! Love that color! looks so yummy! will definately have to try these! Cupcakes. I’m all about making cupcakesvand my own frosting!! Having a mixer would make baking cookies sooo much easier this Christmas! Since the giveaway does not end for a month I will say some Christmas cookies. Actually I was here for the doughnuts, saw this on Pinterest and when I got to the end of the recipe there was a giveaway, bonus for me. Oooohhh, I have to try these! What wouldn’t I make…first homemade pancakes then possibly pizza. Just finished picking all the squash in the garden, so will start with the pumpin donuts and the on to pumpkin/cranberry bread. I use the squash just like pumpkin. Anything pumpkin. I am on a huge pumpkin kick thanks to all the great recipes on Pinterest. I would make a yummy dessert for my family! Cookies, cookies and more cookies of course! The first thing I would make would be pie crust! Always using knives to break up butter gets so old! The possibilities are endless what I would do with the crusts: quiche, pumpkin pie, apple pie, chicken pot pie. 🙂 Love to cook/bake! Stinker, my post didn’t post! I would make pie crust! Cutting up butter with knives gets so old! With the pie crusts the possibilities are endless: quiche, pies, chicken pot pie! Love to cook/bake! I would definitely make my grandmas Banana Bread!!!!! I would make my Grandmothers sugar cookie recipe! She had 11 children so it is a HUGE batch. I burn through a hand mixer everytime I make them. I have tried to cut the batch in half but it seems that it is one of those recipes that just does not turn out the same if you do. I would make homemade bread and cookies!! mmmm I have been dreaming of owning one of these one day! and I can’t wait to try these donuts!! Yum! I would make an Italian cream cake for my husband! he loves it and I love him!! I would make pound cake. I would make loaves of sourdough bread everyday.I am a baker of all kinds of things. I bake every single day for my family of four sons and a sweet husband. Drop biscuits, cookies, pancakes, cornbread. I love to make yeast bread and to knead things by hand, but lately I have wished for some kitchen help. 🙂 This mixer could be my kitchen help, for when I want to make layer cake or pound cake and don’t wish to spend fifteen minutes beating the batter with a whisk. What would I make? My 10-year old son would probably take dibs and make his “famous” chocolate chip cookies. As for me . . . something fall-ish with pumpkin or apples. The color of the mixer is beautiful. I love to bake everything! I am a mom of 4 & my family loves muffins especially blueberry! It will look absolutely perfect on my counter top. I love the color and have never owned a mixer. Chocolate cake with marshmallow buttercream frosting. yummy. I would make bread! I have been making home made bread for my family every week. No more kneading PLEASE!!!! I would definitely try these pumpkin donuts first. 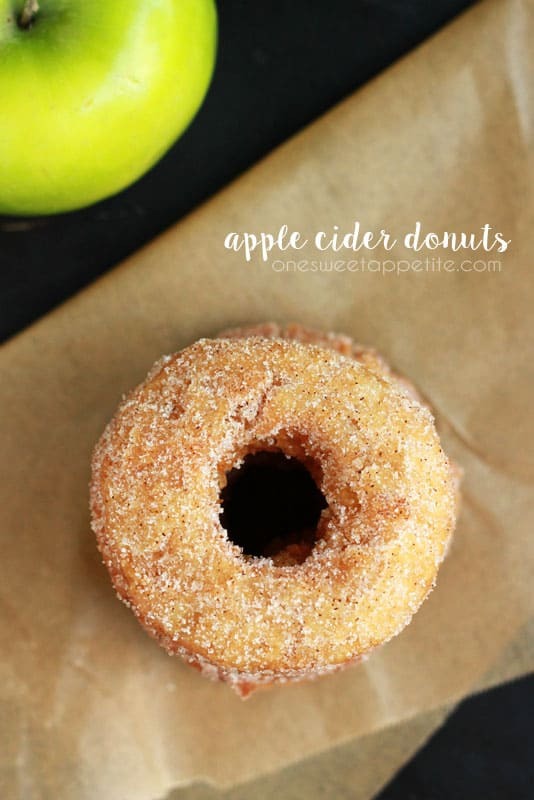 We have a local orchard around here that sells apple cider donuts and these remind me of them. I am brand new to Pinterest and found you via the recipe. I love finding new recipes to try! I would probably make my first cake. I haven’t made a homemade one since high school and I would LOVE to have a for real mixer! Probably those pumpkin donuts…;) …or maybe some cupcakes because those are my favorite & then I would clean out the bowl & whip up some homemade icing to pipe on top! Can’t wait to try these doughnuts and how nice that they are baked. I would have a hard time choosing between two of my favorite family recipes – my mother-in-law’s famous pumpkin bread that my husband grew up with or my mom’s chocolate chip cookies! Cookies may not seem like anything spectacular but it’s what I remember most about baking with my mom when I was little! I would love to win this mixer! My mom gave me her old one (when she inherited my brother’s KitchenAid after he passed away), but in all my 21 years of marriage I’ve never had a new mixer – except a hand mixer that was a wedding gift and is now dying!!! Thanks for the opportunity to win! I would take my 10 year old mixer to school for my cooking club with 26 first through fourth graders and not have to lug it back & forth to school every Monday! Then it would be a batch of Oreo balls in the new mixer. I would then do a batch of everything cookies! I would make Christmas divinity. My old mixer is just not powerful enough. Lots of good food! This Kitchen Aid Artisan would be just the tool to help. I would make a chocolate cake-YUM!!! I have wanted a mixer my whole life. I have a son with Autism so I try to make most everything I can with fresh products. I also do a ton of canning with my grandma. With all the attachments I can put on the mixer it would open up a new world of cooking in our home and my son could help. I am always the designated cook for every family holiday and I make tons of food for fundraising. My husband is a police office and every week I send in colacky’s. A mixer would change my life. All my husband ever hears is how I wish I had a kitchen aid! What an awesome color too. I am a noob baking/cooking blogger and I can think of about 1,000,000 things I would do with this. Including getting a pasta attachment….my mom makes delicious pasta and I would love to be able to replicate it! Yum! I would make some awesome cream cheese frosting and this amazing french bread recipe I found on Pinterest! Oh my, cookies, bread, and it would definitely be put to use for the holidays! Ohhh..those pumpkin donut holes I just saw on your blog. I can’t wait to make them. I would LOVE a Kitchenaid mixer. Thanks for the giveaway. I would make a chocolate cake recipe that I have been wanting to make. Thanks. These muffins look so good. Could I use butternut squash instead since I justed baked one?? I may try the recipe today. Frosting! I hate mixing it by hand. Simply…I would bake fun! My three year old LOVES baking and there is nothing that I enjoy more than seeing her excitement when we break out the chocolate chips! The many recipes I have found on your website! Your pumpkin donuts! They look amazing! I would make big batches of cookie dough! I love baking and decorating cookies around the holidays, but it would be nice to prepare the dough in advance and then bake and decorate later in the season! OOhhh, I’ probably whip up some kind of fall flavoured cupcakes. maybe something with pumpkin and salted carmel. Oh! I was making marshmallows just yesterday and thinking out amazing is would be to have a kitchen aid! My first task would be to make some peppermint marshmallows. yum! Either pumpkin crisp or sweet dreams cookies . I would make cookies,bread,muffins,etc. Anything I could think of since it would be so much easier to bake! I would make pumpkin cinnamon rolls first, then lots of Christmas goodies for friends & family! If I win the mixer I would make yummy rolls for Thanksgiving dinner! I’ve been trying a bunch of bread recipes lately and this mixer would be the biggest help! Yummy rolls for Thanksgiving dinner! This time of year something pumpkin would have to be first! What a help it would be for Thanksgiving!! My first recipe to try out this amazing mixer would be pumpkin sour cream coffee cake. Yum!! Thanks for the giveaway. I would love, love, love, this for all of my holiday baking!! I BAKE ALL THE TIME! I single handedly make about 12 cakes, pies treats each Thanksgiving! I’d attempt bread making if i had this! If I won the KitchenAid stand mixer, I would make this flourless chocolate cake recipe that is soooo good but involves whipping 7 eggs! Peppermint infinity fudge! I’ve tried to make it 3 Christmases in a row, and burned out a hand mixer motor each time. My husband claims he used to successfully make it with a hand mixer all the time, but I think he just likes making a fool out of me once a year. Help me put an end to this mad, cruel ritual. I think I would make pumpkin chocolate chip cookies! I looovvveee to bake and this mixer would allow me to indulge more in my passion and feed and entertain my friends and coworkers! Definitely will be making these doughnuts!!! My favorite color! I would make Christmas cookies to give out as gifts this year! I would also try the pumpkin donut muffins. I love fall baking! I’m with everyone else… Where to start. I think I think these pumpkin donut muffins would be a great way to say thank you for choosing me. The best thing would be to be able to teach my daughter to bake better. She wants to start her own baking company (she’s 10). How wonderful it would be to get her started with a Kitchenaid!?! Thanks for considering me! Oh what a nice, generous giveaway! If I won, the first thing I would make are peppermint mocha cookies! I’d bake up a ton of batches for my friends and family for Christmas! I got married a year ago and never received this off our registry. I’ve been wanting one so bad! Thanks for the opportunity! Bread, cake and a variation of the baked donuts! I would probably make anything and everything you have on your site!!! I would mix dough for scones and bread. My co-workers would be impress. I know from experience of borrowing a Kitchen Aid mixer, that it is NOT only for dessert type foods. I would love to have one to do my Polish Meatballs in. I just know the mixer will mix the ingredients so well together that I will NOT have to roll the meat mixture into balls so diligently!! Same would go for meatloaf!!! I would love this beautiful mixer! Family recipe for sugar cookies would definitely get made in it :). I would make those baked pumpkin spice donuts!!! They look and sound AMAZING!!! If I had a kichenaid mixer I would be in pure heaven. I have Fibromialgia so it is getting harder and harder for me to bake things because I just don’t have the arm strength that I used to. Even using a hand held electric mixer has become a long and painful process. I am known for being the baker in my family, anytime anyone comes over my house I always have some kind of baked good ready to be enjoyed. My greatest fear is that I will unable to do that anymore. I am constantly finding great recipes and tweeking them to make them my own version, and it would hurt my heart if I was unable to be fall in love with a recipe ever again. But I know it’s coming soon. I make cookies for everyone for the holidays, having a Kitchen Aid would make the process so much faster. We also make our own pizzq every Friday, and makinf the dough with the mixer would be awesome! It would be wonderful for all of my Christmas baking! I would make pumpkin bread. these look amazing!!!!! im going to make them in my donut pan to make them a bit smaller and freeze some… is pumpkin puree the same s the canned pumpkin??? My girls & I would love it!!! My girls & would love it!!! First I would make my family some of their favorite oatmeal chocolate chip cookies, and then I would make some goat cheese and caramelized onion scones (for me, because I like savory more than sweet)! 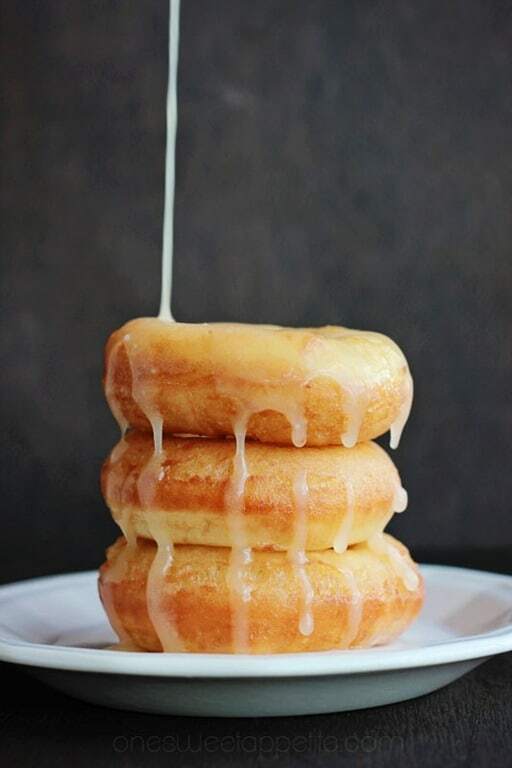 First I would make these donuts! They look amazing! I’d make anything pumpkin! Pumpkin bread is one of my favorites, and pumpkin bars with cream cheese frosting! I’m currently on a pumpkin kick so it would definitely be something with pumpkin. Because I’m gluten free I have to make my almost all of my baked goods myself so I do LOTS of baking. 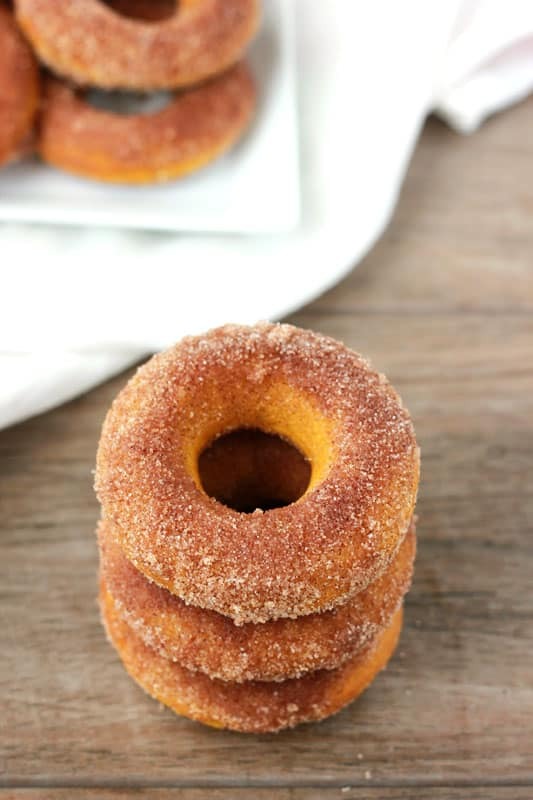 I am looking forward to attempting a gluten free version of these pumpkin donuts! omg how cool. i guess I would be making cakes more often since i try to stay away from them now because they take a lot of prep time without an electric mixer. Hamburgers. Hamburgers? Yep, since you paid for the mixer I would spring on the attachment for grinding meat and make blue cheese burgers with buffalo sauce. The baker in me would start with Pumpkin Rolls, and Pumpkin Muffins, and Pumpkin Bread, and Pumpkin Drops… Oh, the possibilities are endless… (I’ve been on a pumpkin kick!). Pizza dough would be the 1st thing! I would make fresh bread first. Oh man…this looks SOOO yummy. I might just have to make these! I most certainly would whip and whip and whip up a batch of homemade divinity! I remember moving into a new (to us) home. Many things were left, two that gave us the most “squeal” of delight were #1 the stand mixer because we knew mom would be able to make us divinity. #2 was the pair of adjustable rollerskate with the key ! and this house had a real sidewalk that we could skate for a couple of blocks on! The first thing I would make is my dad’s favorite german chocolate cake. Thank you so much for the great recipe and chance to win. We make a lot of chocolate chip cookies with my 3 boys under 5! I would make those pumpkin donut muffins! In fact, I think I’m making them tomorrow! I would make those pumpkin donut muffins too! Then pumpkin bread! I would make lots of cookies! Thanks for the awesome giveaway! I just received a copy of my grandmother’s custard pie recipe. It was the last thing she made for me – she has since passed away. I would use the mixer to make this pie for the holidays. The first thing I would make would be tears of joy in the fact that I own a Kitchen Aid mixer (in aqua!)!! Then I would have fun coming up with new recipes and finding new recipes that my hubby would like! Italian Pudding Cake – takes about 30-45 minutes to beat the eggs. A great test for the mixer. You could try applesauce… I’m not sure if it will turn out or not. Let me know if you try it! The first thing I would make is my grandpa’s recipe for the Bloody Orange cake! My kids have been asking for all things pumpkin, so either another batch of these donuts or some bread. Love the festive recipe. I’m going to put it in the baking rotation! What a great give away. I would first make the standard chocolate chip cookies, the only kind my family likes. Then i would make some fresh bread. How awesome to have come across your blog!! 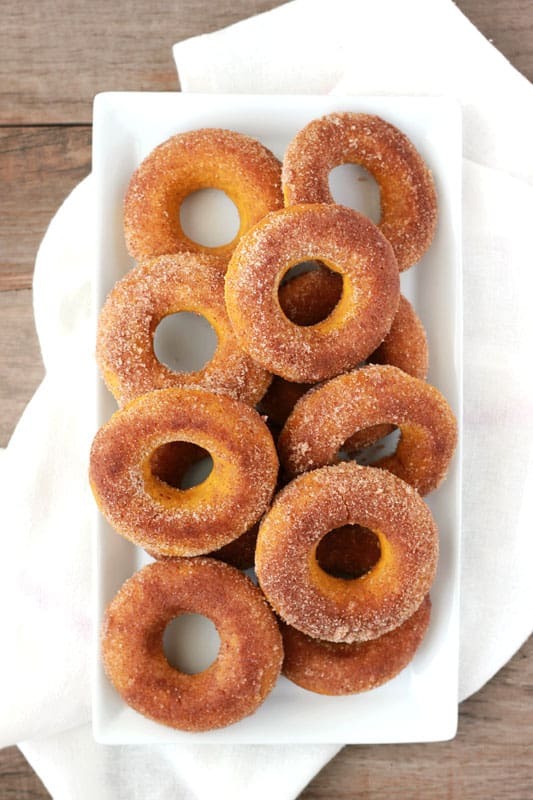 I’m going to try your pumpkin donuts recipe today possibly!! 🙂 I would most likely make cookies first and foremost…. probably chocolate chip cookies or pumpkin drop cookies or molasses cookies or oatmeal raisin cookies or…. 🙂 I had a kitchen aid mixer before, but it died and have been making our cookies the ‘old-fashioned’ way lately…. which isn’t nearly as fun! I have a large family and they love when I bake so I would make devil food cookie dough cheese cake. I sent your recipe over to my daughter, she is the baker in the family, with a request for a couple. These look so good. I love baking, cooking, creating, etc…First thing I would make would be my Aunt Elvis’ pound cake. Best I’ve ever tasted!! Wow! I actually came here for the donuts (Pinterest find) but the giveaway was a great surprise! I’d love a mixer for baking, of course, but also for mashed potatoes! Hi Jesseca, hope you enjoyed the holidays !! I wanted to make these little gems ever sense before Halloween and just did not get around to it. I am actually glad it worked out this way because, well, during the holidays everyone is so busy baking for everyone and his brother the same old request, which by the way, I love doing 🙂 but this year, I saved a couple of “new” ( to me anyway ) recipes to try. Waiting until yesterday to make these was the ticket. I got to sit back and thoroughly enjoy them (well, one anyway, and man was it hard not to eat two of them 🙂 Thank you for sharing. Happy New Year !! !